Do you like reading with the Rider-Waite? The RWS is perhaps the best (and certainly the most common) deck for beginners to read with. Read all about the cards in Waite's guidebook to the Tarot: The Pictorial Key to the Tarot. To get Rider-Waite tarot readings using A. E. Waite's original card meanings, scroll down and select from the list of 18 tarot spreads below. 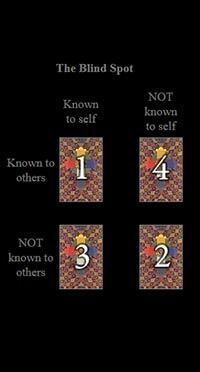 If you're interested in learning about a more advanced method of reading, you may like to try out the Crowley-Thoth deck. For more information about the Rider-Waite, click here. 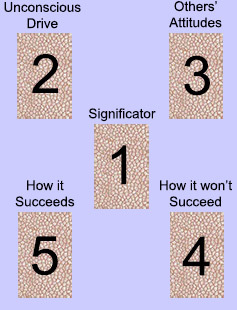 This simple reading is good to use when you wish to narrow your focus to a single point. 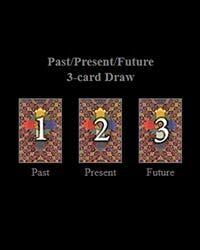 This is a three card reading covering the past, present, and future. This spread is good for advice. It is a simple but versatile spread which can also be used to determine the meaning of a confusing card from a previous reading, or to clear up other points of confusion. 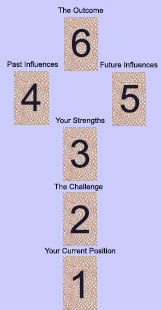 This spread is used to enhance self-awareness. No question is necessary, or questions that concern learning something about yourself. 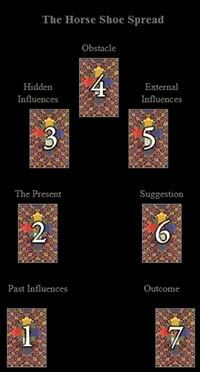 An ancient Celtic method of reading involving 10 cards. 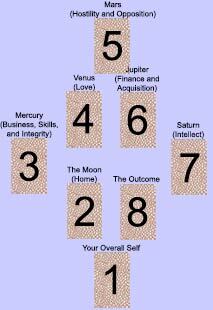 This spread is one of the most commonly called upon by readers of all levels. A very practical spread for questions of all types. 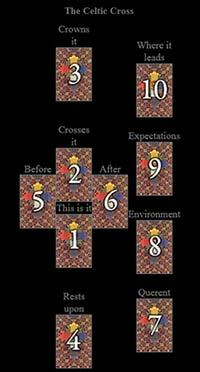 The Ankh Spread is for deeper questions about the causes behind trends. The loop of the ankh shows the deeper spiritual background, while the base shows your prospects for the outcome. This is a standard relationship spread - divided into rational thoughts, emotions, and external stance. Court cards generally indicate actual people with their characteristics. 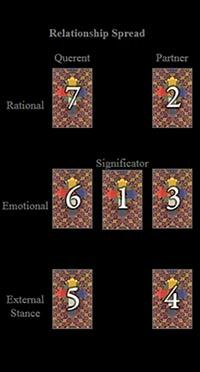 This is a nine card relationship-style reading used to explore matters of the heart. For when you have a certain plan in mind, The Plan Game spread reveals the course of action you should avoid and the course you should take for your plan to succeed. This is a query reading that may yield insight into a number of different aspects of your life's current state. For this spread, you ask a question like: 'What happens if I do (X), and what happens if I do not do (X)?' Two chronological paths reveal the outcome of either choice. For this spread you ask for suggestions on how to behave properly in order to achieve a desired result. The Current column shows how you have been acting, and the Suggested column suggests how you should act in order to achieve your desires. 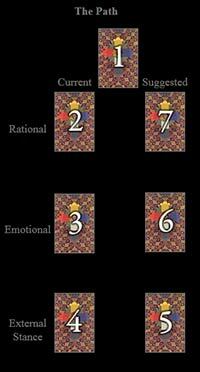 This is a very simple five card reading used to explore your personality. 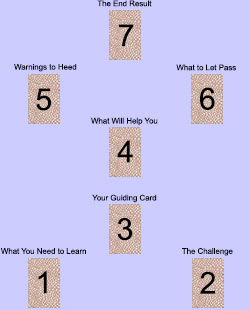 This is a six card reading used to aid in making business and career decisions. 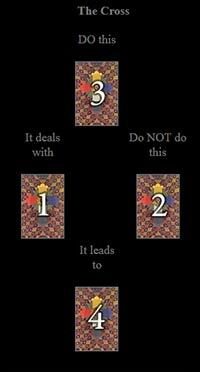 The Horse Shoe is an old classic tarot spread. More advanced than the Past, Present, and Future reading, yet simpler than many other spreads, this versatile method can be used for most questions. 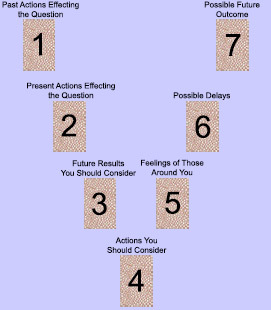 This is an eight card reading used to explore general questions. 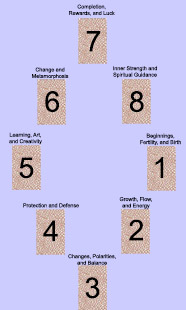 This is a seven card reading used to explore your essence. 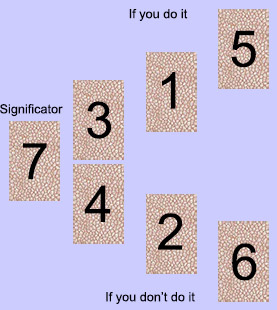 This is a seven card reading used to find solutions for specific situations. Copyright © 2018 Rider-Waite.com. All rights reserved.